Boston Tennis Club’s Men’s Second team earned a 5-1 win against Spalding in Division Two of the Lincolnshire Team Tennis competition. The team was Lucas East, Tom Cozens, Michal Chmielik and Jeremy George-Jones. The Men’s Firsts were due to begin their Regional campaign at Derbyshire Tennis Club on Sunday, but it was rained off and needs to be re-scheduled. Boston’s 14 and under boys had a very good win over David Lloyd, Burton Waters. Max Jones, Tom Mecklenburgh, Ben Robson and Reece Anderson-Doherty won both doubles to secure a 4-2 result. The Orange A team are romping through the matches, claiming a second win for Ben Rudkin, Billy Smith, Matilda Clark and Finley Houghton against opposition David Lloyd, Burton Waters. Boston Tennis Club members performed successfully at the Boston Indoor Easter Grade 4 Tournament. Ben Rudkin won the nine and under boys’ event and Matilda Clark was successful in the nine and under girls’ section. Poppy Gibbons played well but narrowly lost in a third set tie-break 7-10 to Nottinghamshire’s Sophie Lager in the mixed 10 and unders, while Joshua Coghlan won the 12 years and under event. The Dunlop Lindum Lincolnshire Seniors Summer League commenced for the Boston Men’s team, with the Division One intra-club tie. 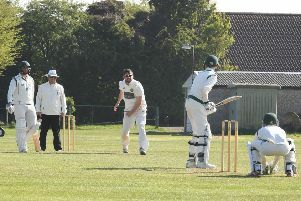 Boston’s Mike Burnett, Anthony Hulley, Owen Jary and James Newton proved too strong for the second team of Chris Cook, John Gibson, David Makins and Andy Clamp.